This brain cell database contains a survey of biological features derived from single cell data, from both human and mouse. It is part of a multi-year project to create a census of cells in the mammalian brain. The database contains electrophysiological, morphological, and transcriptomic data measured from individual cells, as well as models simulating cell activity. Thus far, data generation has focused on select areas of cerebral cortex, and thalamic neurons. 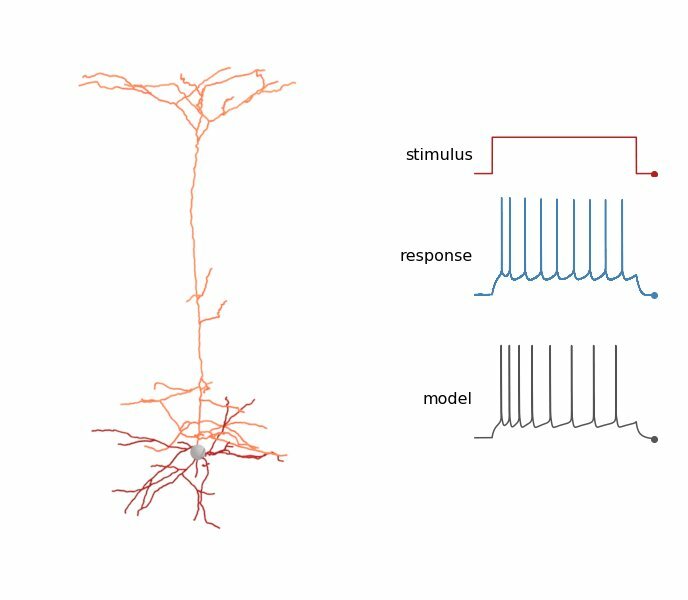 Browse electrophysiological response data and reconstructed neuronal morphologies using the Cell Feature Search tool. Single cell gene expression data can be accessed through the RNA-Seq Data Navigator. Use the Allen Software Development Kit (SDK) to programmatically access and analyze raw data, and to run models. Data can be downloaded by selecting individual experiments in the Cell Feature Search tool, by accessing transcriptomic RNA-Seq files, or through the Allen SDK or API. Cells are acquired from donated ex vivo brain tissue dissected from temporal or frontal lobes, based on anatomical annotations described in The Allen Human Brain Reference Atlas. For electrophysiological and morphological analyses in the cortex, cells are selected based on soma shape and laminar location. For transcriptomic analysis, individual layers of cortex are dissected, and neuronal nuclei are isolated. Laminar sampling is guided by the relative number of neurons present in each layer. Cells are acquired from selected brain areas in the adult mouse. Cells are identified for isolation using transgenic mouse lines harboring fluorescent reporters, with drivers that allow enrichment for cell classes based on marker genes. For electrophysiological and morphological analyses, excitatory cells with layer-enriched distribution and inhibitory cells expressing canonical markers were isolated. Brain areas selected for analysis include subregions from visual cortex, motor cortex and anterior lateral motor cortex (ALM), in the secondary motor area (MOs). Subregions from visual cortex (secondary visual areas) are also included. For transcriptomic analysis, regional and laminar dissections were performed on specimens from pan-neuronal, pan-excitatory, and pan-inhibitory transgenic lines, to sample comprehensively. Data from the lateral geniculate nucleus (LGd) is also included. These interactive Venn diagrams show how many cells are available for each data modality (electrophysiology, morphology, transcriptomics) and models. Whole cell patch clamp recordings provide basic information about cell firing properties. Recordings are performed using a range of stimulus protocols, including short pulses, long steps, slow ramps, and naturalistic noise to characterize the intrinsic properties of these neurons. Detailed protocols are described in the electrophysiology overview technical whitepaper. Cell structure informs function and neuronal diversity. To view cell shape, cells are filled with biocytin and serially imaged to visualize their morphologies. Planar images and 3D cell reconstructions can be viewed with the cell's electrophysiology data or downloaded for offline analysis. Detailed protocols are described in the morphology overview technical whitepaper. RNA sequencing can provide a transcriptomic profile for each cell. Gene transcripts are isolated from whole cells or nuclei, amplified, and sequenced, and then reads are aligned to a reference genome. RNA expression per gene is reported as the number of reads aligning within gene bounds, scaled by sequencing depth. For nuclei, a significant proportion of these reads align to introns. Data from human and mouse cortex is browsable and all data is downloadable from the RNA-Seq Data page. Detailed protocols are described in the transcriptomics overview technical whitepaper. All data can be programmatically accessed via the Allen Brain Atlas Application Programming Interface (API). There are example queries specific to the Cell Types Database available to help you get started. The Allen Software Development Kit (SDK) provides code for accessing electrophysiology data in the Neurodata Without Borders file format. Neuronal reconstruction files are available as SWC files. The Allen SDK also provides sample code demonstrating how to download neuronal model parameters and run your own simulations. All biophysical models require NEURON simulation software to be installed, whereas the GLIF models use a custom Python simulator included in the Allen SDK.